Patch 13 brings you the new and improved shockwave and a ton of overdue bug fixes. The star of Patch 13 and this weekend’s Skirmish is our Shockwave special ability. Did you know that the underrated Shockwave does a whopping 180 HP of damage? To make it even better, Shockwave now shoots through walls! And as the cherry on top, we also pumped the speed of the Shockwave from 50 m/s up to 75 m/s! Since it turns out that we greatly miscalculated how long it takes for someone to grab a glass of soda or tell their dog to stop eating the headset’s wires (again! ), we upped the AFK detector’s wait-time from 30 seconds to 3 minutes. – And the Shield hitbox problem that left the character vulnerable in extreme positions has also been removed – You can now stretch and jump as much as you want, safely tucked away in your Shield’s hitbox. Shockwave Showdown is our first Skirmish dedicated to a special ability. In this week’s update, we pumped the Shockwave up to penetrate walls! Aim the Shockwave the same way you aim with any of the weapons – just point in the direction you want to blast the Shockwave. Even if your opponent thinks they’re super sneaky by hiding behind a wall, you know better! Send those waves rippling and may the King or Queen of the Shockwave be crowned by the end of this Skirmish! 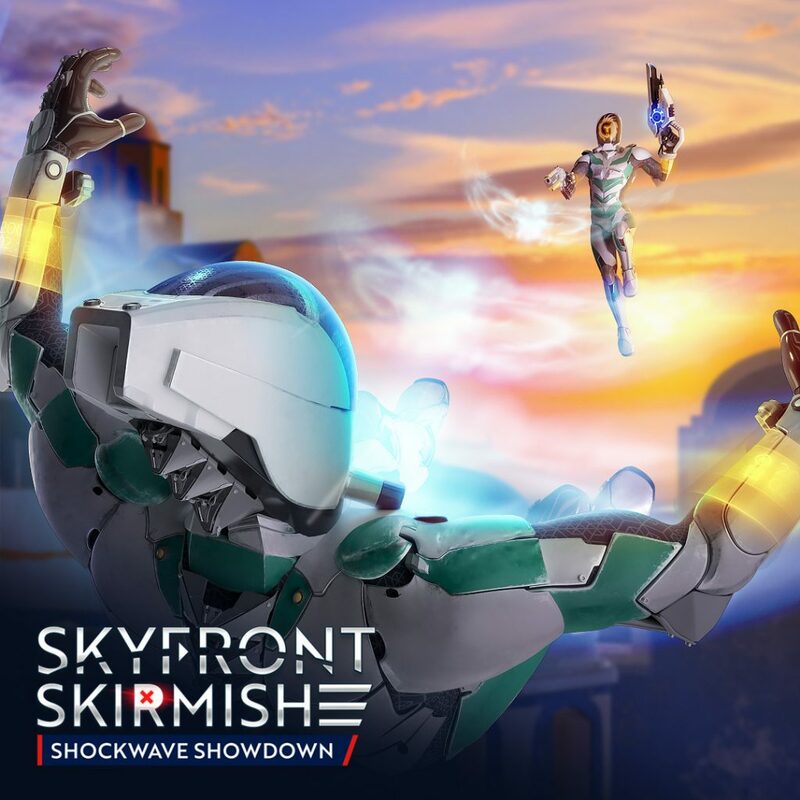 Skyfront Skirmish: Shockwave Showdown will begin Friday March 9th at 8 PM UTC and end Monday March 12th at 5 AM UTC. – Players will compete for the most kills with the Shockwave special ability during a single Deathmatch game. – Your death count will not affect your chance of winning – we are only looking at your kills with the Shockwave special ability. – A player’s high score with the Shockwave will be registered at the end of the game or when the player exits the game. – You may use other weapons and special abilities, but only the kills you make using the Shockwave will be counted towards your high score. – Players are forbidden from teaming up and assisting each other or using bugs or glitches with the intention of getting a better high score. – Abusive behaviour will not be tolerated in-game, especially in VOIP – keep it friendly! – The high scores will be counted for games with a minimum of 3 players at the start of the game. NOTE! If the game starts with three players and two players leave before the end of the game, the high score of the last remaining player will be locked the moment the second to last player leaves the game. – The winners are the players with the top three highest scores at the end of the Skirmish. – Arcade accounts are excluded from the Skirmishes (see Important Notes below). – Prizes will be awarded at the end of the Skirmish. – Skyfront will attempt to contact the winners of the Skirmishes, but to guarantee that you get your due prize asap, please contact the devs on Skyfront’s social media or Discord channel. High scores from arcades will not be included in the Skirmishes. Separate events will be organised for arcades. That being said, arcade players are still more than welcome to join in on the Skirmishes, but their scores will not be counted towards anything. All Skyfront Skirmishes will be moderated to ensure no one is cheating or breaking any rules. Skyfront Skirmishes are weekend challenges that Skyfront organises every couple of weeks. During each Skirmish, players will compete for a certain high score (e.g. most kills, best multikill, killstreak, most kills with a certain weapon, etc.) that will be announced the week of the event. Play time is limited to the duration of the Skirmish and all weapons and special abilities are allowed, unless stated otherwise (e.g. if the Skirmish is devoted to a specific weapon). Each future Skyfront Skirmish and the prizes of future Skirmishes will be announced separately. If you love the Skirmishes or have any suggestions for what we could do better or differently, give us devs a shoutout on our Discord channel at https://discord.gg/kkh6qag.